Training your ear is something that is extremely valuable but hard to acquire. You cannot train your ear by just reading. It requires that you can hear the differences in sounds. After you play a while your ear develops more and more. This is not something that you can learn instantly, but there are ways to help you hear things better. 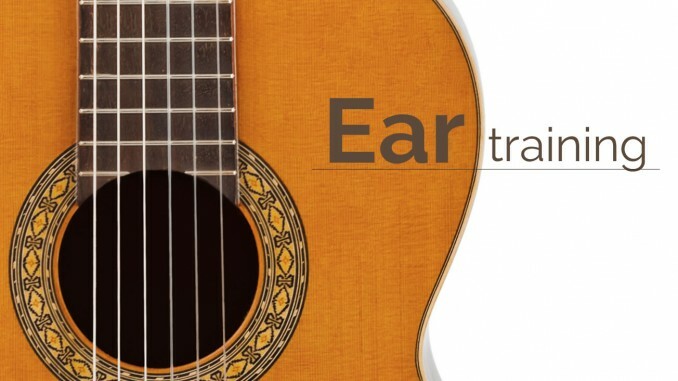 I have included audio files so that you can learn the differences between the various chords. Listen to the following examples. Try to hear the differences between each of the chords. Once you think that you can tell the chords apart take the test below. It will play five chords. See if you can tell which one is which. By the way, the chords E chords instead of A chords this time. Check your answers at the bottom of this page. You can test yourself if you can get a friend to record himself playing a bunch of chords. try it with several different chords. In the previous section, we concentrated on recognizing chords. In this section, we will concentrate on recognizing notes. Remember, the only way to train your ear is to listen several times. There is no easy way out. Play the given note. Keep listening until you think that you can recognize them. Then take the test below.